Indeed, nothing more beautifully simplifying has ever happened in the history of science than the whole series of discoveries culminating about 1914 which finally brought practically universal acceptance to the theory that the material world contains but two fundamental entities, namely, positive and negative electrons, exactly alike in charge, but differing widely in mass, the positive electron—now usually called a proton—being 1850 times heavier than the negative, now usually called simply the electron. Time, Matter and Values (1932), 46. Cited in Karl Raimund Popper and William Warren Bartley (ed. ), Quantum Theory and theSchism in Physics (1992), 37. It would seem that more than function itself, simplicity is the deciding factor in the aesthetic equation. One might call the process beauty through function and simplification. As quoted in Christian Science Monitor (7 May 1952). Mathematics is often considered a difficult and mysterious science, because of the numerous symbols which it employs. Of course, nothing is more incomprehensible than a symbolism which we do not understand. … But this is not because they are difficult in themselves. On the contrary they have invariably been introduced to make things easy. … [T]he symbolism is invariably an immense simplification. It … represents an analysis of the ideas of the subject and an almost pictorial representation of their relations to each other. In Introduction to Mathematics (1911), 59-60. Science means simplification. It substitutes a single rule for a million miscellaneous observations. In Chats on Science (1924), 4. The central dogma, enunciated by Crick in 1958 and the keystone of molecular biology ever since, is likely to prove a considerable over-simplification. That is the heretical but inescapable conclusion stemming from experiments done in the past few months in two laboratories in the United States. 'News and Views', Nature, 1970, 226, 1198. The method of science depends on our attempts to describe the world with simple theories: theories that are complex may become untestable, even if they happen to be true. 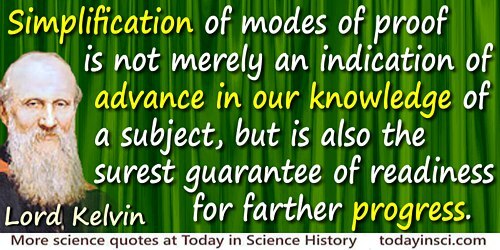 Science may be described as the art of systematic over-simplification—the art of discerning what we may with advantage omit. The present state of electrical science seems peculiarly unfavorable to speculation … to appreciate the requirements of the science, the student must make himself familiar with a considerable body of most intricate mathematics, the mere retention of which in the memory materially interferes with further progress. The first process therefore in the effectual study of the science, must be one of simplification and reduction of the results of previous investigation to a form in which the mind can grasp them. First sentence of Maxwell’s first paper (read 10 Dec 1855), 'On Faraday’s Lines of Force', Transactions of the Cambridge Philosophical Society (1857), Vol. X, part I. Collected in William Davidson Niven (ed. ), The Scientific Papers of James Clerk Maxwell (1890), Vol. 1, 155. From Varied Types (1903), 126. 'Probability abd Uncertainty—the Quantum Mechanical View of Nature', the sixth of his Messenger Lectures (1964), Cornell University. Collected in The Character of Physical Law (1967), 128. To remember simplified pictures is better than to forget accurate figures. In Otto Neurath, Empiricism and Sociology (1973), 220.